Laughter – it’s the best medicine | MAX Solutions. Do you need an assessment? Everyone enjoys a good laugh. Beyond simple enjoyment, there are numerous physical and psychological health benefits to laughing. And better still, it doesn’t matter what causes you to laugh; the benefits remain. While the human mind can make a distinction between simulated and spontaneous laughter, the human body cannot1. You can laugh right now for no reason and improve your health. Funny, isn’t it? Laughter also improves your mental health by acting as a coping mechanism and by enhancing interpersonal relationships. 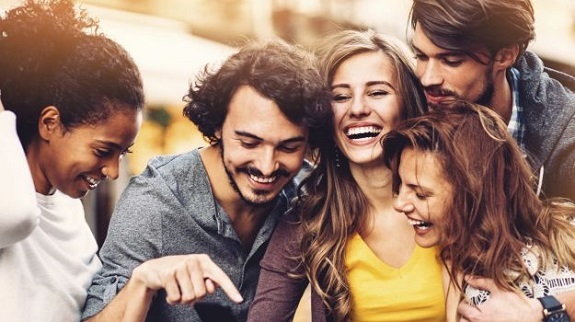 Scientists2 believe that the primary purpose of laughter is to increase the bonds between people, this is particularly true for shared laughter which promotes relationship wellbeing. Surprisingly, it is true regardless of whether laughter is forced or spontaneous. Intensifies mirth and is contagious. Laughter is distracting. It captures your awareness in the same way that sneezing does3. Processing something humorous requires your full attention which creates a complete distraction. Getting a joke does not allow for divided attention. If you are practicing mindfulness, laughing is a good way to do it. Mirthful humour enhances mood, sometimes for an extended period. It also creates an improved outlook and an ability to perceive your own situation from a different frame of reference3. Around the world, there are laughter clubs that practice what is now becoming known as laughter yoga. You can find one near you by typing “laughter club” and your location into your search engine. For assistance with any issue, no matter how serious it is, contact your EAP on 1800 629 277 or by emailing support@maxsolutions.com.au. 3. Mahony, DL; burroughs, WJ; Lippman, LG; Perceived attributes of health-promoting laughter: a cross-generational comparison; The Journal of Psychology; Mar 2002; 136, 2; Psychology Database pg 171. For more information or to register with us, please leave your details below and we will call you back to arrange an appointment. Please enter your details below and a member of our team will be in touch. Keeping long distance relationships healthy Travel for work is much more common than it was a fifty years ago. Work life balance Having work life balance sounds wonderful doesn’t it? Providing employment, disability and training services in suburban and regional areas across Australia including Brisbane, Sydney, Melbourne, Darwin, Adelaide, Hobart, Perth, Canberra.